Schroeder, Ryan et al. The Prescription Drug Problem: A New American Crisis?. Praeger, 2019. ABC-CLIO, publisher.abc-clio.com/9781440857706. Providing an indispensable resource for undergraduate students, graduate students, and policymakers interested in the prescription drug abuse crisis in the U.S., this book comprehensively summarizes the current state of prescription drug abuse and its growth over the past 20 years. 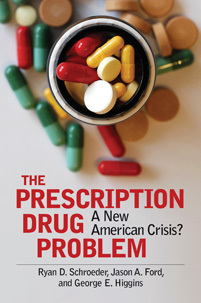 • Provides a comprehensive overview of the prescription drug crisis in the U.S.
• Identifies the most common causes of prescription drug abuse in the U.S.
• Examines possible solutions to prescription drug abuse in the U.S.
SortTitle: prescription drug problem: a new american crisis?